Please include links as well as a description of the particular value of each website to the Jewish bookmark collection. Someone has to say it. Judaism.SE Mi.Yodeya.com! Hebrew Books: various texts as PDFs, many of which are not elsewhere online, as far as I know. Some of them have OCR (I don't know how good it is), but most, as far as I can tell, do not. Nonetheless, they're good if you know the title or author you seek and don't need to search within the book. Perpetual Jewish/Civil Calendar: Jewish-Gregorian calendar for any year you like. Jewish Calendar - Useful if I want to quickly lookup what day is Yom Tov, etc. Jews for Judaism - A response to missionaries. JewFAQ - If you don't see it in our FAQ, check this out. It's hugely informative. Mi Yodeya - Judaism Stack Exchange. MyZmanim - Prayer times, customizable to your location! GoDaven - Find a minyan nearby just about anywhere. Mechon Mamre - Tanach in Hebrew and English, and more. Tanach with Rashi - via chabad.org. Rashi's full commentary, in English. Soncino Translation of the Talmud - Scroll down for additional books. Prof. Marcus Jastrow's Dictionary of the Talmud. Rambam's Mishneh Torah - via chabad.org. In English. Kitzur Shulchan Aruch - A condensed version of codified Jewish law. Hebrew Wikisource - Full Hebrew books library. 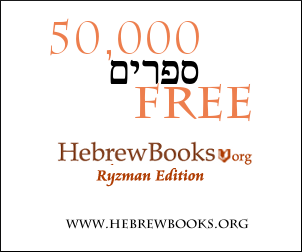 Hebrewbooks.org - Thousands of PDFs of just about any sefer you could need. This is a good question: maybe we should put together one master list somewhere, indexed and with descriptions? Finally, in addition to using Jastrow's dictionary (here), I rely very heavily on Morfix, which is an online Israeli Hebrew dictionary. It's fast, it's reasonably accurate, and if you're working through anything in Israeli Hebrew (for example, Kehati's Mishna commentary, or Rav Steinsaltz's Hebrew peirush on gemara) it's hard to do without. So far as blogs are concerned, there are really not many that I like, but the absolute top of the list would be On The Main Line, which is a very scholarly (and very entertaining) exploration of Jewish historical esoterica! Second to that, and at times a distant second, is Rabbi Gil Student's Torah Musings. It can be a very good source of Jewish news, and Rabbi Ari Enkin's halakhic contributions are always worth reading. Unfortunately, they do not yet seem to be archived anywhere on the site, and so you have to look through manually in order to find them. I also really enjoy occasional posts at The Talmud Blog, find very useful Rabbi Natan Slifkin's database of sources testifying to the scientific errors of Chazal, and sometimes enjoy his blog, Rationalist Judaism, as well. Another great meta-index of Torah and Jewish websites: Jewish Sources on the Net by Dr. Melech Tanen. Wikipedia also hosts an annotated bibliography of Torah e-text websites. It discusses hebrewbooks.org, Mechon Mamre, and about ten others. This Lubavitsh library ספריית אגודת חסידי חב"ד - אהל יוסף יצחק - ליובאוויטש has digital, searchable texts of a couple of hundred sefarim. Most of the collection is sefarim of Chabad interest: Keser Shem Tov (by the Baal Shem Tov) and Ohr Torah (by the Maggid of Mezeritch), various works of the rebbeim of Chabad-Lubavitch (including really fundamental ones like Tanya and Shulchan Aruch Harav), plus some from their prominent disciples; some books discussing specific areas of halachah as elucidated and practiced by Chabad; and some books on general Chabad history and personal memoirs. Lots of quality audio and video at SimpleToRemember. See the categories at the bottom right. For any study of Tanach, I would have to add the fantastic online Mikraos Gedolos at mg.alhatorah.org which contains a large number of commentaries in a clear, organized fashion. The search function works excellently as well, and has a much larger database than just what is found in the Mikraos Gedolos. I highly recommend The Mercava. It has all sorts of classic Jewish literature in its library but I use it mainly for it's daf yomi side. Each daf of the Gemara is fully translated along with the Rashi into English, and it's linear too. Just take a look at what I mean, beginning with Berkahot 2a. Surprisingly, all of the Hebrew Wiki websites are a phenomenal resource. They often have well-sourced articles on various topics in Judaism, and specifically Torah personalities. Many times you can find something new on the Hebrew Wikipedia that you can't find on the English version. ויקיפדיה - The Hebrew version of Wikipedia. ויקיטקסט - The Hebrew version of Wikisource. ויקימילון - The Hebrew version of Wiktionary. While we're on the topic, Wiktionary is actually quite concise when it comes to tracking down an unfamiliar Hebrew word. Shamash: The Jewish Network (www.shamash.org/) 'strives to be the highest quality central point of Jewish information and discussion on the Internet. Our mission is to provide state-of-the-art Internet tools to Jewish organizations and individuals who maintain Web sites and/or discussion forums for the benefit of the Jewish community. Shamash is the oldest and best known Jewishly oriented service accessible through the Internet. Shamash serves the full spectrum of Jewish organizations utilizing new electronic technologies to share information and deliver services to the Jewish community worldwide.' Its 'Links' section contains a vast array of links to other sites on the Internet as, for example, Yahoo - Jewish Links.com - Home and Virtual Jerusalem. Click 'Links' at the home page, then 'Portals' when you get the result to see those and many more. At the home page, click the highlighted link Jewish Resources on the Internet. The page which you will be given, Judaism and Jewish Resources, is a masterpiece in layout created in November 1993 by Andrew Tannenbaum and contains a gold mine of information. Not the answer you're looking for? Browse other questions tagged internet product-recommendation . Mah tov la-adam bachayim - mi yodeya?